A man stands in the foreground. In the background are seen two vehicles in states of disorientation. A truck shaped like an oil tanker has a rdioactivity sign on the circular tanker portion. It is lying on the ground crooked as if it has fallen over. Next to it is a vehicle shaped like a van, with wine glasses drawn on its side. This vehicle rests on its side. Lines on the ground suggest that the vehicles are at the edge of a road or highway. The man speaks into a cellphone: Our wine truck collided with a radioactive supplies truck. All the wine is contaminated! A woman stands and points to a writing board. Two men nearby are apparently the woman'a audience. One sits on a chair in front of a computer monitor. The other stands behind him. The computer monitor sits on a small table and in front of the monitor on the table is a wine glass. Between the two men and the woman is a small circular table. On the table can be seen a wine bottle and two wine glasses. The writing board has a forumula on it: N = N0•0.5 ** (T/(243/365.25)). 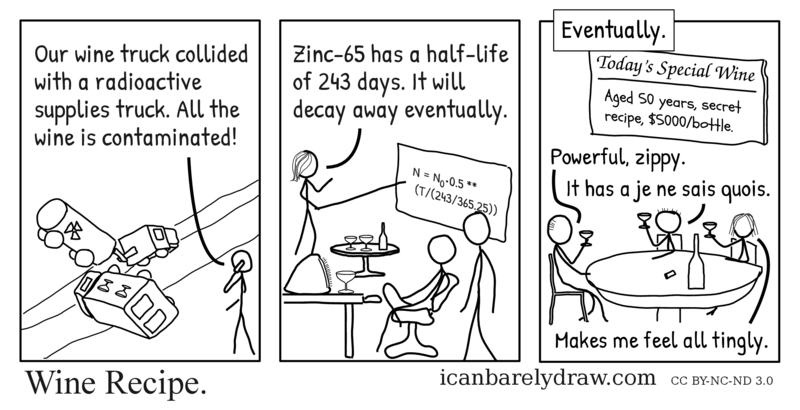 Woman: Zinc-65 has a half-life of 243 days. It will decay away eventually. A posted sign in the background displays underlined text in a decorative font: Today’s Special Wine. Below that is a horizontal line and then handwritten text: Aged 50 years, secret recipe, $5000/bottle. Three people are sitting at a circular table. On the table is seen a wine bottle and a cork. Each of the three people is holding a raised wine glass. Man 1: It has a je ne sais quois. Woman: Makes me feel all tingly. Hilarious idea. But feels like it’s not based on real science. Both of those trucks are intact (so it’s kinda far-fetched to suggest that some radioactive substance spilled and mixed with all of the wine somehow). Though I suppose radiation could ionize the wine or something affecting it’s composition. Maybe the mutant wine is 80% LSD. Wait, wait, if I understood correctly, the end result would be Xenon! 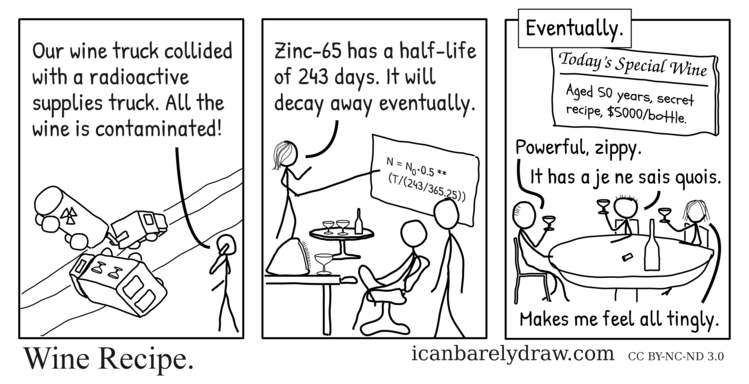 A noble gas! So the wine would turn into champagne with bubbles of noble gas! How awesome is that? !